UPDATE 12pm: The bushfire at Karara is contained but QFES crews remain at the scene blackening out. The bushfire is burning in inaccessible country near Strathyre Rd and Rabbit Fence Rd, Karara. There is no threat to property at this time but smoke may affect surrounding areas. QFES advises that if they are affected, residents should close windows and doors and keep respiratory medications close by. Motorists are advised to drive with caution and to the conditions. If residents are concerned their property is under threat they are advised to phone 000 immediately. INITIAL 7am: Firefighters will return to the scene of the Karara bushfire this morning to monitor the blaze. 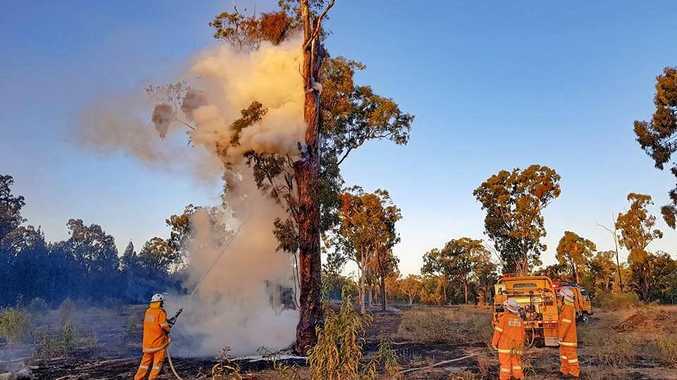 A spokeswoman from Queensland Fire and Emergency Services said crews reported they had left the scene overnight, but would continue to monitor the fire as it continued to burn. At this stage the fire is under control. An advice warning still remains in place for the Karara bushfire, advising residents to keep up to date with the state of the fire and decide what actions to take if the situation changes. Phone 000 immediately if you believe you or your property is under threat.